On Scene: A Ben 2-Plus Low Rider, on sale for you. 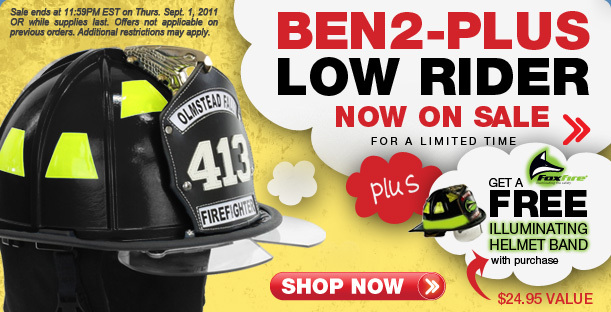 A Ben 2-Plus Low Rider, on sale for you. We've got sales galore going on around here, and this week we're featuring our Ben 2-Plus Low Rider and offering a special sale for you! Not only is this great, much-loved helmet on sale, but we're also offering a free FoxFire illuminating helmet band with each purchase. This is a $24.95 value. If you want to freshen up on the details of FoxFire's great products, check out this blog post from the past. Back to the case at hand, The Ben 2-Plus Low Rider. Have you seen this helmet? Have you put one on your head and felt the sleek, low-profile design? The new and improved "low rider" design delivers a lower center of gravity making for superior fit and comfort that can't be beat. With this newly designed suspension system it allows for more balance, reducing the strain and pressure on your neck, head and shoulders. 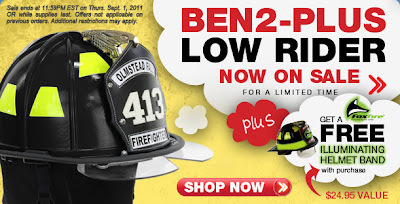 The Ben 2 is the lightest weight, most cost-effective, composite-traditional style helmet. So, if you're in the market for a helmet like this, check out the details and specs of this guy. Hurry--you have today and tomorrow (9/1 until 11:59pm EST) to get the sale price, plus a free illuminating helmet band.